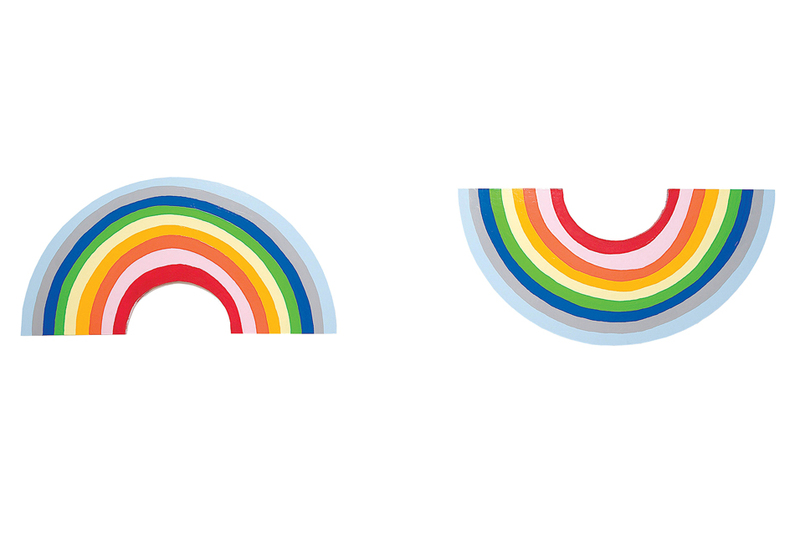 Cary Leibowitz, Sad Rainbow, Happy Rainbow, 2007. Latex paint on two wood panels, 24 x 53 in. each. Collection of Amy Cappellazzo. Image courtesy of Alexander Gray Associates, New York, NY. Cary Leibowitz: Museum Show. On view January 26June 25, 2017 at The Contemporary Jewish Museum, San Francisco. With a preference for lowbrow aesthetics and threadbare materials, Leibowitz creates work with a bold, cartoon-like quality: pop colors are combined with a childish scrawl, proclaiming abundant displays of insecurity and exposing simplistic raw truths about contemporary society. The exhibition, the first career survey and solo museum show of Leibowitzs work to date, will feature nearly 350 original artworks from 1987 to the present: paintings, fabric works, multiples, installations, documentation, photography, and ephemera. In both his cheeky multiples (inexpensively mass-produced buttons, mugs, and more) and his irregular-format paintings, Leibowitz mixes his obsession with popular culture, fine art, and Jewishness with elements of therapy and self-loathing, interrogation and self-interrogation, institutional critique, social commentary, and stand-up comedy routine. His work manages to seamlessly blend comedy and neurosis in such a way that questions about appearance and identity become a running commentary on the self/other. In addition to original works, the exhibition will also include many of the multiples created specifically for individual exhibitions that carry on his obsession with popular culture, identity, and fine art, including team pennant flags for Homo State that say, Go Fags!; a Marcia Tucker seat cushion; a Cindy Sheehan megaphone; and JAdore Gertrude Stein buttons. One installation features a display of his editioned work, Gain! Wait! Now!, 2001, an aluminum garbage can that features an image of Leibowitz as a chubby adolescent at his bar mitzvah in 1976. Cary Leibowitz: Museum Show is organized by The Contemporary Jewish Museum (The CJM) and is curated by CJM Associate Curator Anastasia James. The exhibition is accompanied by a 224-page fully-illustrated hardcover catalog with contributions by James and Leibowitz, as well as Rhonda Lieberman, Hilton Als, Simon Lince, Fran Drescher, David Bonetti, and Glen Helfand. Cary Leibowitz (b. 1963, New York) also known as Candyass, is an American artist whose work has shown in museums and institutions across the globe including The ICA Boston; The Walker Arts Center, Minneapolis; the Frankfurter Kunstverein, Frankfurt; The Aldrich Museum of Contemporary Art, Ridgefield, CT; the Guggenheim Museum, New York; The Whitney Museum, New York; The Jewish Museum, New York; MoMA PS1, New York; The Indianapolis Museum of Art, Indianapolis; The Wexner Center for the Arts, Columbus, OH; The Andy Warhol Museum, Pittsburgh, PA; Badischer Kunstverein, Karlsruhe, Germany; White Columns, New York; Philadelphia Museum of Jewish Art, Philadelphia, PA; Art Metropole, Toronto; Kunstverein für die Rheinlande und Westfalen, Düsseldorf; Bonner Kunstverein, Bonn, Germany; Cabinet Gallery, London; The Kitchen NY; Galleri Nicolai Wallner, Copenhagen; Art Institute of Chicago, Chicago; Galerie Claudio Botello, Turin, Italy; List Visual Arts Center, MIT, Cambridge, MA. Leibowitzs work has been included in the landmark exhibitions Too Jewish? Challenging Traditional Identities at the Jewish Museum in New York; In a Different Light at the University Art Museum, University of California Berkeley; and Bad Girls, New Museum, New York. His work has been reviewed in The New Yorker, Artforum, The New York Times, Frieze Magazine, and Art in America, among others. Leibowitz is represented by INVISIBLE-EXPORTS.